SharePoint has taken the corporate intranet by storm. Nearly two-thirds of medium to large-size organizations in the 'Western World' have SharePoint in some shape or form (SP 2010, WSS or MOSS, enterprise-wide deployment or department level deployment). SharePoint is complex and simple, expensive and cheap, and robust and limited. It's many things to many organizations, and still unfulfilling to others. While it is a complex technology platform, it is first and foremost a web development platform. In other words, it is what you make of it, but it can require a lot of time and money, and it does require a lot of planning. 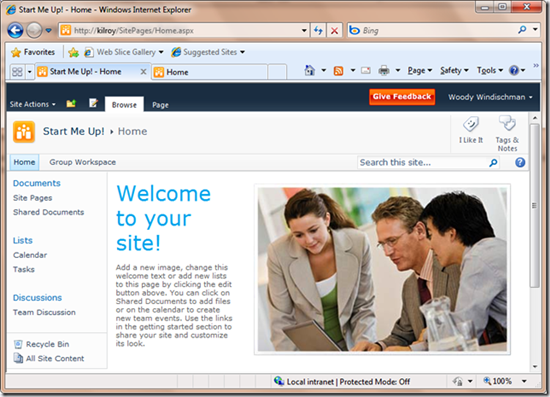 Not only do we use SP 2010 for our own intranet, most of our clients use SharePoint as well. Based on years of experience with dozens of corporate intranets, our technology-neutral approach defines business and functional requirements with a proven methodology for aligning SharePoint and employee collaboration needs with organizational goals and strategy. Business Requirements Analysis – we will interview, gather and analyze feedback from key leaders and stakeholders the current needs and opportunities for improving employee communications, productivity, and information sharing. Plan – Prescient will develop a detailed plan that documents the organization’s need, the intended benefits, the specific strategic directives, objectives, and measurable goals for the ongoing management of SharePoint as an intranet platform. The plan also includes recommendations for a high-level information architecture to structure significant user content. Governance & Policies – we will define the roles and responsibilities of the intranet’s owners, key stakeholders and content owners, site developers and managers. A comprehensive governance model will include a detailed Intranet Policy detailing rules and guidelines for creating and managing team and project sites, and content pages. Additional Options Available – user research, industry and competitive intranet benchmarking, business case development and ROI, functional plan, detailed information architecture and wireframes, content management planning, design, technology audit and planning, employee communications and marketing. Prescient's strength and focus is measured online success. Prescient’s team of consultants has extensive intranet and website experience with more than 150 clients; we were early adopters of technology platforms such as content management systems and social media, and are frequent users of SharePoint 2010 that powers are own internal intranet. We have wide & deep experience working with SP2010 and multiple technology intranet and website environments. Prescient boasts a full roster of satisfied, world class, Fortune 500 clients. We are the only web consulting firm that promises to build success measures (critical success indicators) into each and every project. We have the largest roster of expert speaking engagements of any firm in its class with dozens of conference, seminar & webinar events across the globe every year. Prescient has the most published team of experts of any firm in its class with hundreds of published articles to date. We have won more than a dozen awards including a prestigious Webby Award. For more information on the SharePoint Plan, please contact us directly or call us at 416.926.8800. Learn about our Intranet Intranet Management Team.